Hi, I am interested in your 1982 Jeep CJ 7 (stock #4663-ATL) listed on Autotrader for $36,995. I'd like to get more information about this vehicle and confirm its availability. This 1982 Jeep CJ7 is a bona fide four-wheel fun machine. It features enhanced power under the hood to anchor a smooth running drivetrain, as well as ample ground clearance for surmounting any obstacles you might encounter when leaving the confines of the asphalt. Its sure a lot of fun to look at as well - its exterior is decked out in a great looking, distinctive shade. By the time this 82 debuted, Jeeps had long since established themselves as able multi-purpose performers, not only serving the military and legions of weekend warriors, but also the more conventional car buying public looking to get behind the wheel of a rugged, yet still civilized ride. Unlike its predecessors, it sports noticeably more squared off openings on its sides to accommodate full-fledged steel doors -which come included - and, with the option of both a bikini top and full soft top at your disposal, youll have plenty of access to shelter when you so choose. Make no mistake though, this CJ7 is configured for rugged duty as well - the front bumper is equipped with tow hooks, a brand new Smitty Built X20 winch and a set of KC lights to illuminate the path forward and youll find a tow hitch on the rear bumper. It sits about three inches higher than in factory configuration, which translates into markedly improved ground clearance when navigating rugged terrain. The exterior sports a burgundy shade thats deeper and richer than what you normally see and carries a nice, smooth finish. The black interior has been stylishly refurbished while still holding firm to its off road sensibilities. The pair of high-backed, stock style seats look fresh as can be and now wear covers that feature contrasting red piping as they sit over a floor that has been well coated to protect it from the elements. A lockable center console is situated between the buckets, offering some welcome interior storage space and providing a secure home for the JVC AM/FM head unit that offers iPod connectivity and teams with the Memphis Audio kick panel speakers and rear subwoofers to provide a great sonic experience. An ultra-sharp looking chrome tilt column has also been added, combining with a Billet Specialties steering wheel to create an eye-catching combination. Some AutoMeter gauges join their traditional counterparts on the dash - and all function just as intended. The air conditioning runs in top form and really comes in handy for everyday driving. An impressively clean and well-detailed engine bay waits under the hood - were talking show quality here! The inner fenders and firewall have been coated for both looks and durability and the 350 V8 sitting front and center wears a powder coated Weiand intake manifold and a Quick Fuel carb and carries a mild performance cam to provide a nice lope, as well as an awesome throaty sound out of the Hedman headers. Its a very responsive, quick-revving engine and it sits surrounded by a dazzling array of polished components. An aluminum radiator and electric fan are in place to keep temperatures under control. The engine pairs with a smooth shifting automatic transmission, and 4-wheel drive surefootedness is within easy reach via a Hurst-gripped lever inside the cabin. The power brakes feature slotted and drilled calipers up front, while power steering makes this classic Jeep easy to navigate on its set of 17 Moto Metal wheels wrapped in Mickey Thompson tires showing plenty of tread. 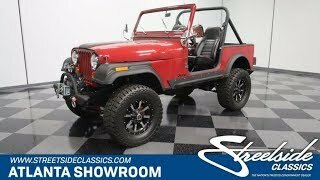 With its combination of outstanding upgrades and ample power, this 1982 Jeep CJ7 is an absolute must see . Call today!